The truth is that silver is a rare metal, more rare than gold. Silver reserves have been estimatated at one-hundredth of gold reserves. Silver is after all consumed by industrial processes and reserves have dwindled over the years because the price has been kept so low for so long by market manipulation. Why is that? This market manipulation dates back to the last silver boom of the late 70s and the spectacular $50 spike in the price in 1980. The central banks then saw suppression of the silver and gold price as a part of their war on inflation. They clearly lost that war but kept gold and silver prices down until this decade. Thirty-one years later and we are still not back to those silver prices despite a seven-fold increase in the global money supply. On that reckoning silver ought to be $350 an ounce, not $30 today. However, the snap back for silver prices now has the capacity to be sensational, and far beyond the mini-spike in the first few months of this year from $30 to almost $50 again. So those who go seeking out physical silver to buy at current prices are going to be very well rewarded and soon, not in 31 years! ArabianMoney continues to stick with silver as our top tip for 2011 (click here) and that means a big rebound in the price before the end of the year. 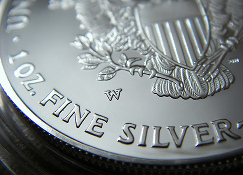 Silver prices are still trading range bound, seemingly ignoring the shortage of supply, but analyst feel that the prices which are going here are driven mostly by more than what is underground, a annual of 4.1 % decline in the production has not directly led to the fact that there is more above the ground.